This Roof Cowl Kit is designed for metal roof installations. It comes complete with a cowl, a 60cm long flue (30 gauge galvanised steel), suitable roof flashing and mounting ties. This model is a 100mm size. The unique design of these cowls provides efficient air exhaust expulsion, and also offers superior protection from rain, back drafts and rodents – unlike regular open type roof cowls. The mushroom cowl is aluminium. Note the colour differs from the image shown, most items are silver. The cowl slips over the roof pipe to prevent rain water running down the inside of the pipe. Click on the PDF button to the right to download instructional information regarding installation. 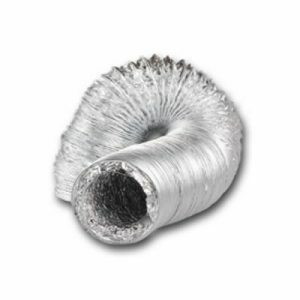 This Roof Cowl Kit is designed for metal roof installations. It comes complete with a cowl, a 60cm long flue (30 gauge galvanised steel), suitable roof flashing and mounting ties. This model is a 125mm size. 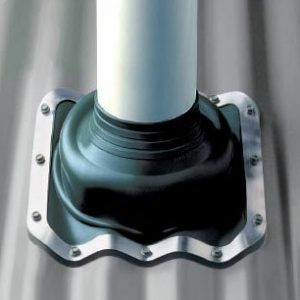 This Roof Cowl Kit is designed for metal roof installations. It comes complete with a cowl, a 60cm long flue (30 gauge galvanised steel), suitable roof flashing and mounting ties. This model is a 150mm size. 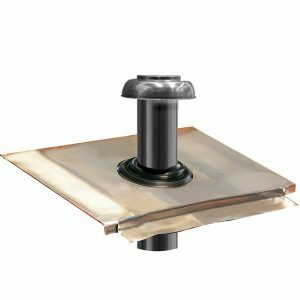 This Roof Cowl Kit is designed for metal roof installations. It comes complete with a cowl, a 60cm long flue (30 gauge galvanised steel), suitable roof flashing and mounting ties. This model is a 200mm size. 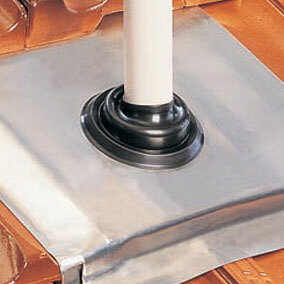 This Roof Cowl Kit is designed for metal roof installations. It comes complete with a cowl, thru roof mounting tube and metal roof flashing. The unique design of these cowls provides efficient air exhaust expulsion, and also offers superior protection from rain, back drafts and rodents – unlike regular open type roof cowls. This Roof Cowl Kit is designed for tile roof installations. 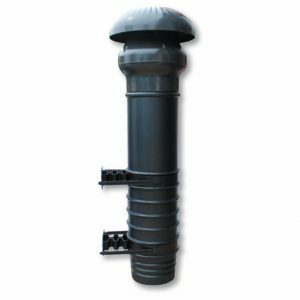 The kits come complete with a cowl, 60cm long flue (30 gauge galvanised steel), suitable roof flashing and mounting ties. 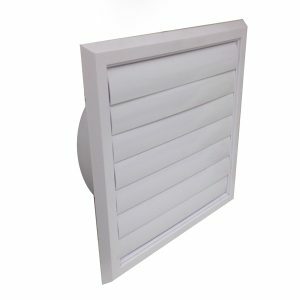 The unique design of these cowls provides efficient air exhaust expulsion, It also offers superior protection from rain, back drafts and rodents – unlike regular open type roof cowls. The mushroom cowl is aluminium. Note the colour differs from the image shown, most items are silver. Perfect for flashing pipes on metal roofs. The multi-application flashing in a highly durable EPDM or silicone, edged with a flexible aluminium band, flashes hot or cold flues and pipes on metal roofs. The square base fits any prepared hole on most roof profiles. Fits flues with an external measurement between 5-127mm. Suitable for roof pitch 0-45 degrees. Fits pipe 100mm or 125mm but will fit anything from 5-127mm diameter. Fits flues with an external measurement between 75-175mm. Suitable for roof pitch 0-45 degrees. Fits pipe 150mm but will fit anything from 75-175mm diameter. Fits flues with an external measurement between 100-200mm. Suitable for roof pitch 0-45 degrees. Fits pipe 200mm but will fit anything from 100-200mm diameter. Fits flues with an external measurement between 170-355mm. Suitable for roof pitch 0-45 degrees. Will fit anything from 170-355mm diameter. This product won't stain or corrode spouting and gutters. The base is 99.9% pure grade aluminium – strong, malleable and much easier to install than a lead collar, and much safer too. Dektite provides a weather proof seal for your roof mounted exhaust fan/vent. Fits flues with an external measurement between 50-170mm, so typically piping in 100, 125 and 150mm sizes but will fit anything from 50-170mm diameter. This product won't stain or corrode spouting and gutters. The base is 99.9% pure grade aluminium – strong, malleable and much easier to install than a lead collar, and much safer too. Fits flues with an external measurement between 110-200mm, so typically piping in 200mm size but will fit anything from 110-200mm diameter.